Blair To Visit Washington And Calif.
British Prime Minister Tony Blair headed to Washington Friday to discuss strategies for ending the Mideast crisis, amid growing pressure at home for Britain to distance itself from its longtime ally and call for an immediate end to violence between Israel and Hezbollah. Blair also is scheduled to travel to California, the first visit to the state by a serving British leader, for talks with Silicon Valley executives and to address a meeting of Rupert Murdoch's News International media conglomerate at Pebble Beach. Blair left London's Heathrow Airport for talks with U.S. President George W. Bush that will focus on building momentum for a cease-fire, Blair's spokesman said, as well as a plan for an international peacekeeping force. But Blair is aware that many in Britain believe he should align himself with the United Nations and European Union and call for an immediate end to the fighting in Lebanon, using the White House meeting to press Bush to add his support to such a move. An open letter published Friday in Britain's The Independent newspaper and signed by former British Cabinet ministers and ambassadors urged Blair to help broker a swift cease-fire. It warned that any continuing support for Israel's military action could become as unpopular with the public as the 2003 U.S.-led invasion of Iraq. The letter was also signed by musicians Damon Albarn, Peter Gabriel and Brian Eno and writers Harold Pinter, Will Self and Gillian Slovo. "The prime minister is going into the trip with some very serious issues to discuss. He is extremely focused on trying to solve these issues," said a spokesman for Blair's Downing Street office, on customary condition of anonymity. While the topic of discussion will remain the same when Blair arrives at 1600 Pennsylvania Ave., Bush is likely to opt for a different greeting than on the last occasion the two leaders met. 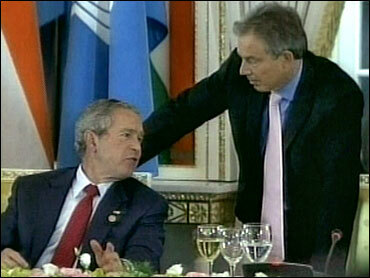 At the recent Group of Eight summit in Russia, the president hailed his colleague with a hearty, "Yo, Blair! ", a salutation that led to more domestic criticism for Blair. The comment, made in an overheard conversation, has had British citizens, lawmakers and columnists wondering aloud if there is substance to the view that Blair is the junior partner in an unequal trans-Atlantic relationship. During his U.S. visit, Blair must also take account of an uproar in Britain over allegations that two U.S.-chartered planes carrying missiles to Israel stopped to refuel at Scottish airport without providing authorities with details of their hazardous cargo. That pit stop has provoked new criticism from those who question what Britain receives in return for its "special relationship" with the U.S., particularly in light of divisions between the nations over international trade and climate change. Menzies Campbell, leader of the opposition Liberal Democrats, said "Britain should say no" to the flights. "I think one would have hoped that the U.S. government would have been sensitive to the fact that this is an issue which is causing a great deal of concern in the United Kingdom and would not have made such requests," Campbell told British Broadcasting Corp. radio.